The views expressed in this information product are those of the authors and do not necessarily reflect the views of FAO. Toral-Granda, V.; Lovatelli, A.; Vasconcellos, M. (eds). Sea cucumbers. A global review of fisheries and trade. FAO Fisheries and Aquaculture Technical Paper. No. 516. Rome, FAO. 2008. 317 p.
The present document reviews the population status, fishery and trade of sea cucumbers worldwide through the collation and analysis of the available information from five regions, covering known sea cucumber fishing grounds: temperate areas of the Northern Hemisphere; Latin America and the Caribbean; Africa and Indian Ocean; Asia; and Western Central Pacific. In each region a case study of a “hotspot” country or fishery was conducted to highlight critical problems and opportunities for the sustainable management of sea cucumber fisheries. The hotspots are Papua New Guinea, Philippines, Seychelles, Galapagos Islands and the fishery for Cucumaria frondosa of Newfoundland in Canada. Across the five regions, the scale of catches and the number of exploited species varies widely, the Asian and Pacific regions being those with the highest catches and species diversity. Most fisheries are multispecific, or have evolved from single-species to multispecies fisheries as the more valuable species became overexploited. There are many typologies of sea cucumber fisheries, ranging from artisanal, to semi-industrial and industrial. The bulk of the catches are exported to supply the Asian bêche-de-mer market, with China Hong Kong Special Administrative Region (SAR) the main export destination for the totality of countries reviewed. With the exception of some stocks in the temperate areas of the northern hemisphere, sea cucumber stocks are under intense fishing throughout the world. In Latin America and the Caribbean it appears that high valued commercial species have been depleted. In the majority of the countries reviewed in the Africa and Indian Ocean region stocks are overfished. Likewise in the Asian Pacific region the most sought-after species are largely depleted. Despite the fact that sea cucumber fishing is not a traditional activity, a large number of coastal communities have developed a strong dependency on it as alternative source of income. Reconciling the need for conservation with the socio-economic importance that these fisheries have acquired will require effective management efforts, which are currently lacking in many places. The hotspot case studies show for instance that, despite the adoption of management plans in some countries, the lack of enforcement capacity poses considerable constraints on the effectiveness of adopted management measures, besides exacerbating illegal, unreported and unregulated fishing and trade. The papers also discuss some of the factors behind the unsustainable use of sea cucumbers and the role and potential benefits of alternative management measures, such as the Convention on International Trade in Endangered Species of Wild Fauna and Flora (CITES). 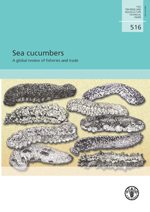 The lack of capacity to gather the basic information needed for management plans, weak enforcement, the high demand from international markets and the pressure exerted from resource-dependent communities figure high as important factors responsible for the critical status of sea cucumber fisheries worldwide. Authors concur on the need for immediate actions to stop the trend of sequential depletion of species if we are to conserve stocks biodiversity and sustain the ecological, social and economic benefits of these resources.